$125, plus $6 shipping in U.S.
Email me if you'd like to purchase this painting. 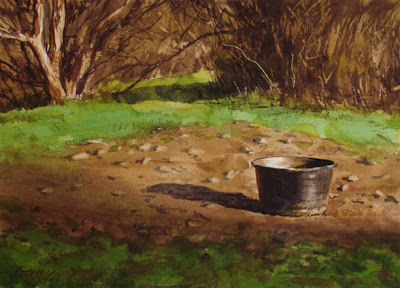 Whatever the subject, I think ultimately all my paintings are about light. Thanks Jason, I appreciate that. I often think the same thing. The subject is a good framework for painting the light. Hi Frank--so true. For many people, "meaning" in a representational work resides only in subject matter. That is a narrow and simplistic view. Artists recognize subject as a pretext--the launching point for a variety of formal and emotional explorations. The range of associations and meanings that a good painting can convey may ultimately have very little to do with the thing depicted. I love the way the light gives the feeling of freshness--it feels like early morning to me!